Algenist Multi-Perfecting Detoxifying Exfoliator is a very good exfoliator that produces very good results. It made our skin feel very soft, smooth and more polished after just a few uses. It also has great ingredients and smells really, really good (definitely one of our favorites among exfoliators). The only thing we didn’t like about this product was it’s very high price. But considering the excellent results we saw, this is one case where we think it’s actually worth it! Algenist Multi-Perfecting Detoxifying Exfoliator has the consistency of a white, creamy paste. The mechanical exfoliation in this product are granules from algae minerals. Those granules are very small, but there are quite a few of them! The best way to describe it is a light, fresh, floral scent. The combination of hibiscus and daisy in the formula could have something to do with that. Whatever it is, we like it! The application process for Algenist Multi-Perfecting Detoxifying Exfoliator is pretty straight-forward. It goes on like a white mask– which is nice because you can see exactly where you’re applying it. It takes a few splashes of water to rinse it off once you’re done exfoliating, but it’s nothing too difficult. Based on what the tube says, you’re supposed to use this 2-3 times per week. We didn’t experience any drying or redness after using this product. After using Algenist Multi-Perfecting Detoxifying Exfoliator a few times, we definitely noticed softer, smoother, more-polished skin on our face. It’s got some ingredients in it that can help clear up skin from blemishes and reduce pore size. As for the strength of this exfoliator, we’d put it in the “medium” category. It’s not super rough but it has enough oomph to it to get the job done! They put some chemical exfoliation ingredients in there like salicylic acid and some mechanical exfoliation ingredients like diatomaceous earth and algae minerals. It gives you the best of both worlds when it comes to effective facial exfoliation. They round out the formula with a few beneficial cosmeceuticals like willow bark, beet root and hibiscus extract. 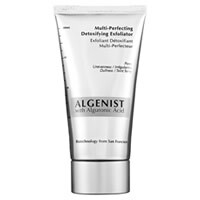 Coming in at $38.00 for a 2.7 ounce tube, Algenist Multi-Perfecting Detoxifying Exfoliator is a pretty expensive exfoliator. At $14.07 per ounce, it’s not the most expensive one we’ve used, but it’s definitely in the “pricey” range. To buy Algenist Multi-Perfecting Detoxifying Exfoliator, click here.